Below you will read a message that was in my inbox today of the 2nd Annual Lowcountry Book Club Convention. As I am currently working on my next book, “The Pulpwood Queen Goes Back to School” it has been nearly ten years since I published my first book, “The Pulpwood Queens’ Tiara Wearing, Book Sharing Guide to Life” now published under my maiden name Kathy L. Murphy with a New cover and New forward. Pat Conroy and his lovely and talented wife, Cassandra King Conroy both blurbed my book. That was a really big deal to me as Pat first, was and still is my all time favorite author and Cassandra’s books, I adore and have selected every single one as Pulpwood Queen Book Club Selections. Since I am the Queen I select all my reads as they have to be the books that tell a story that has not been told before, in a unique way. They must be well written and they must be discussable. Pretty simple guidelines but you would be surprised how may books do not fit my criteria. Nothing is more exciting for me than sharing a great story. You see those stories in those books saved me, They were my refuge when life came at me and was just too hard to deal with and why I am on a mission to promote authors, books, literacy, and reading. Luckily for me, with my 760+ chapter Pulpwood Queens and Timber Guys Book Club members, we, for almost twenty years have been working to do just that. So this morning when I received the email on the 2nd Annual Lowcountry Book Club Convention coming up in Beaufort, South Carolina and read that is was funded in part by grants from South Carolina Humanities and a gift from the Pulpwood Queens book club and realized that we finally are having an impact on are all time mission. The mission to promote authors, books, literacy, and reading. To see the fruits of your labors being shared with the wonderful world of reading, for me, gives me great validation of a life well lived. For that I thank you to The Pat Conroy Literary Center and to my book club members who has made this happen. Some people think that I am most proud of getting on Oprah or Good Morning America, or all the many print publications or even the fact that I sold my book to film rights to DreamWorks, yes, those things are true and good. But the truth of the matter is I just really want to get everybody on the same page that reading is as important to me as to the world. To teach a child to read well gives them all the tools they need to become successful in life, without a good knowledge of reading, a child is handicapped forever. Think about everything you do that involves reading. To drive, to apply for a job, to go to the grocery store and shop, everything we do in life involves reading. The better you read the better you succeed. So in this world of dire straits, do the one thing that is a win, Win, WIN for everybody. Join a book club, take on a literacy project, volunteer to read to a child, read at a library, donate to The Pat Conroy Literary Center. I would hope you too would consider joining me book club, The Pulpwood Queens and Timber Guys Book Club and read my book, “The Pulpwood Queens’ Tiara Wearing, Book Sharing Guide to Life” by Kathy L. Murphy. It is the first book you are to read when you join my book club but then there are lists and lists of books in my book that can become the springboard to a lifetime of reading. As I begin the last chapter of my life I sense an urgency to make my life’s work known and understood. My greatest fear is that someday when I can no longer to what I do, all the fruits of my labors will be lost. I know in my heart that reading is not as important to some of you reading this as me. I am driven, that is a fact. But I do know what saved me in life was reading about others who were feeling just what I was feeling. I knew from reading “The Great Santini” by Pat Conroy I was not alone. Readers are most of the time invisible to others. That is why our only rule is “where TIARAS are mandatory and reading our book books is the ONLY Rule!” We deserve our day in the sun, so wear the CROWN, join us and promote authors, books, literacy, and reading. I mean, my oh my, we helped finance this 2nd Annual Lowcountry Book Club Convention. This made me cry, good hard tears. We did good Pulpwood Queens and Timber Guys now won’t you ALL join me and let’s help these literacy and literary endeavors continue. To join my Pulpwood Queens and Timber Guys Book Clubs, Click Membership on top menu bar at www.thepulpwoodqueens.com and then CLICK Girlfriend Weekend to purchase the package to come hear ALL our Official Pulpwood Queens and Timber Guys Book Club Authors. The Pat Conroy Literary Center is my charity of choice and our Author Silent Auction during our event donates ALL the proceeds to the center to help keep there literary programs growing. Our Author Dinner will feature Jonathan Haupt, Executive Director for the Pat Conroy Literary Center and Author, Nicole Seitz as moderators for OUR PRINCE OF SCRIBES: Writers Remember Pat Conroy panel as they are the editors for this incredible read. It is also our Official October Book of the Month read so by purchasing the book you are also helping the center as proceeds from the book go back to the center. I can also tell you this book is one of the best books I have ever read and my CROWN JEWEL in all my Pulpwood Queen and Timber Guy Reads. To tell you how high a mark that is before my favorite book was “To Kill a Mockingbird” by Harper Lee, OUR PRINCE OT SCRIBES has taken it’s place. So you ask, what is in this for you Kathy? All I can say is that I will never have two dimes to rub together because in everything I do, it is about putting it all back in to my life’s work. Success to me is exactly this, being able to help fund an event with The Pat Conroy Literary Center. That’s the ultimate success for me. these ripples build a current that can sweep down the mightiest walls of oppression and resistance. Now I will get back to my writing and creating my art because that is what keeps me sane and helps me express all that is important in my life. I listened last night to interviews on some pretty famous people, Katherine Hepburn, Kirk Douglas, Truman Capote, Alfred Hitchcock and one thing stood out as very clear. The work! It is the work that you do in your life that gives your life value. Make your work about something you are passionate about and you too will have a successful life. Onward and upward my dear friends! My hope is you will share this story, my story with others because you see, it is all about sharing our stories that makes us truly human. Now an annual event, the Pat Conroy Literary Center’s Lowcountry Book Club Convention is a day of educational conversations and fellowship programs for book club members and those considering joining a book club. This free public event is presented in partnership with the Technical College of the Lowcountry and funded in part by grants from South Carolina Humanities and a gift from the Pulpwood Queens book club. 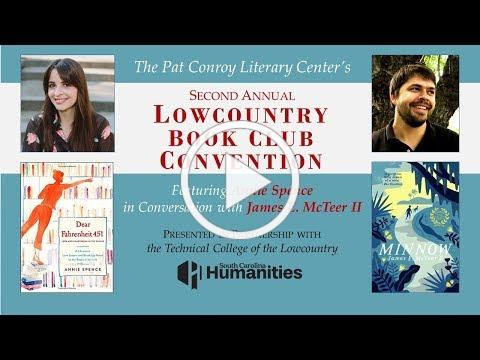 Keynoting our second annual Lowcountry Book Club Convention will beAnnie Spence, author of Dear Fahrenheit 451: Love and Heartbreak in the Stacks, in conversation with fellow librarian James E. McTeer II, author of the lowcountry novel Minnow.